Reminds you to take breaks at calculated intervals. Is there a better alternative to Stretch? Is Stretch really the best app in Health and Fitness category? Will Stretch work good on macOS 10.13.4? Stretch is an innovative break reminder app. Nowadays people spend more time working or playing on their Mac, but they don't know or don't pay attention to the dangers that come from this behavior. Human bodies need to move, not sit in front of a Mac all day. Moreover, most apps that try to fix this problem are boring and uninteresting. So we introduced Stretch, a new way to make people take breaks and stretch with easy-to-follow and attractive user interfaces. Stretch needs a review. Be the first to review this app and get the discussion started! 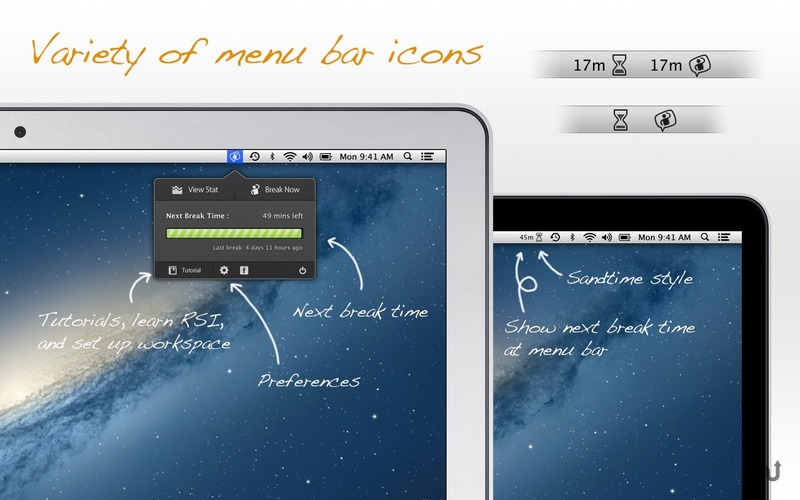 Stretch is built from the ideas of easy-to-use and attractiveness. We use our complex logic to calculate break time and notify users to break with a modern, beautiful, and non-intrusive break reminder. The app will then show some stretches out of 40 possible stretches using every part of body. With our high quality video and description, it is be easy to follow the stretches. 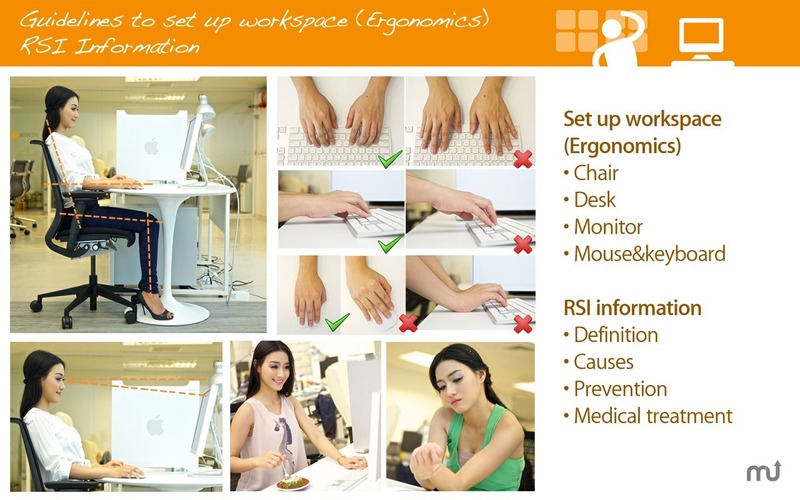 Stretch also contains the information on Repetitive Strain Injuries (RSI) and also a list of guidelines to set up your workspace to have improved ergonomics. 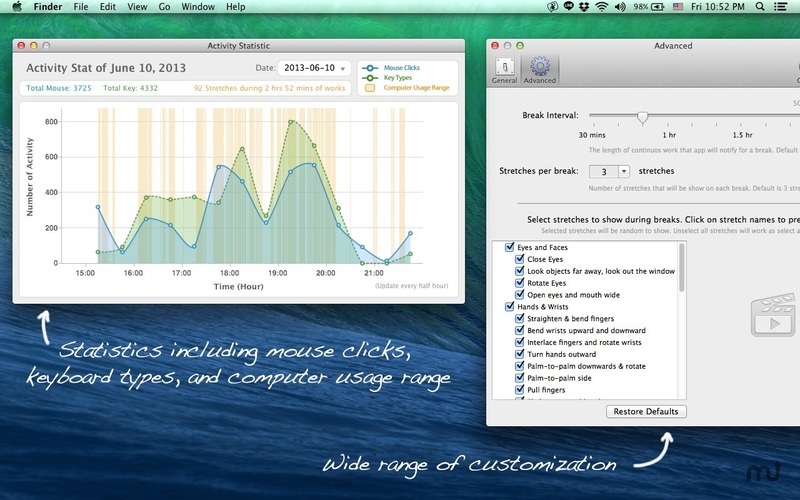 Moreover, the app shows usage statistics including mouse clicks, keyboard types, and also the length of computer usage. Note: Stretch requires "Enable access for assistive devices" to be enabled.